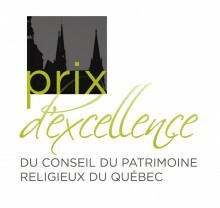 Since 2013, the Québec Religious Héritage Council has been recognizing each year, through the Awards of Excellence, some outstanding achievements that reflect the commitment, innovation and passion of Quebecers for their religious heritage. Two new award categories now highlight the commitment of individuals to the promotion and enhancement of religious heritage. These people are essential actors in the ecosystem of safeguarding these cultural goods. Volunteer involvement of an individual for the promotion or safeguarding of the religious heritage in Quebec. Aménagement de la bibliothèque Félicité-Angers dans la nef de l’église Saint-François-de-Sales.